One of the leading lights in the smartphone revolution, Motorola has long been a name to be reckoned with when it comes to mobile communication devices. The latest foray by the industry giant is into the lucrative smartwatch market, with a much-rumored model known as the Moto 360 said to be heading for a September launch. The smartwatch market may still be very young but it has attracted entries from just about all the major players in the communications field, and this latest model from Motorola, the details of which have been carefully guarded, may be among the most interesting yet. There is some dispute as to whether the Moto 360 will be built with a metal body or a plastic one; the latter would indicate a more cost-effective model, the former more stylish and traditional. Images have been releases that show a neat and clean design, very modern yet with classic overtones, and it is believed to have a screen that is 1.88inches in diameter. The watch will have to compete with some notable new entries – including the much-anticipated Apple iWatch – when it is eventually put on the market, so pricing could be a key sales area. 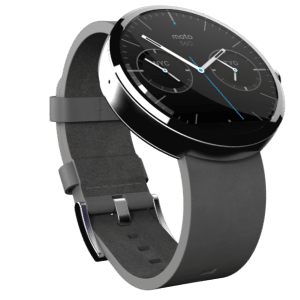 What to expect from the Moto 360 is open to supposition; we believe it will come with a range of features including Bluetooth capability, probably a music player and much that is offered by existing smartwatches, and it will also be water and dust resistant. It will run with the tried and tested Android Wear operating system which is popular with many other models on the market, and specially devised for this sort of device. It should therefore be easy to use and navigate and offer familiar operation for Android users. Smartwatches were predicted by many to be the ‘in’ gadget of 2014, and the proliferation of exciting new models from some of the top names in the market has proven this to be the case. With every-increasing capability and some very impressive models at great prices there is no doubt that these clever gadgets will find many buyers, and the market will continue to grow apace as more manufacturers take advantage of escalating interest from the public. Motorola has entered into the fray with a very neat introductory model that should be well priced compared to its main rivals, and will be looking to the future for indications of where to head next.